Director Quentin Tarantino has drawn plenty of inspiration from the music of Ennio Morricone over the years – either using short passages of older Morricone music in his films, or evoking the substance and style of the maestro in the way he uses sounds from other sources too! 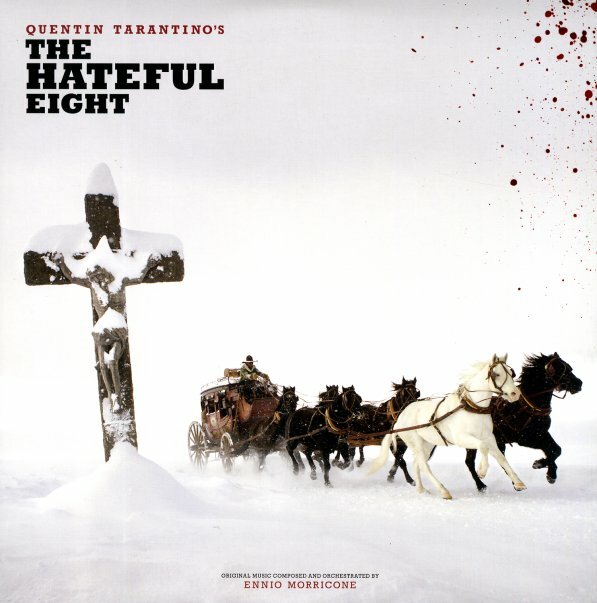 So it's only fitting that this time around, the pair are finally brought together fully – as Morricone turns out one of his best soundtracks in years for Tarantino's Hateful Eight – a brooding, suspenseful tale that owes plenty to the western generation that first sprung Morricone to global fame! Yet as with most of Ennio's best work, the style here is something that goes far beyond expectation – orchestrations that take on a style completely their own – with instrumental elements that have stronger focus amidst the larger charts, and a sense of mood and color here that's completely sublime. The record is mostly music from Morricone – written for the film – and features a few passages of dialogue from the movie, plus just a few additional tracks by The White Stripes, Roy Orbison, and David Hess. Yet it's more than fair to think of this as a complete score by Morricone – very different than the usual compilation-style soundtracks we've had before from Tarantino. © 1996-2019, Dusty Groove, Inc.